My paternal grandfather’s sympathies were evenly split, I think, between cowboys and Indians. When he died, my grandmother begged me to take a few items from his closet. I kept a button-up cowboy shirt with a nighttime western scene stitched on the back. It was too large for me and I’d never seen him wear it, but it reminded me of him. Grandpa used to tell us kids that the bypass scars on his chest and leg were won in a Great Plains ambush, the marks of Indian arrows and tomahawks. When he wasn’t being attacked by Indians, he was reading about them. Visiting as a boy, I would browse for hours through his well-fingered copies of Black Elk Speaks and National Geographic’s World of the American Indian. He and my aunt (during her New Age phase) once attended a sweat lodge ceremony together. I think it was in a Guy Davenport essay that I first read a reference to Henri Frankfort’s Before Philosophy. I bought a dollar copy, an old Pelican paperback, at a used bookshop near my office. In the book, Frankfort and his co-authors attempt to reenter the mind of pre-rational man through a study of Egyptian and Mesopotamian metaphysics, politics and ethics. They want to chart the transition from an “I-Thou” relationship between man and nature to an “I-It” relationship – a movement from experience conceived in terms of encounters with living forces to a world where natural phenomena could be understood in terms of impersonal cause and effect. Frankfort doesn’t touch on it, but it occurs to me that the European settling of the Americas – in which my yeoman farmer ancestors were early participants – was, among other things, a conflict of these two perspectives. A similar thought must have occurred to Davenport, who was also fascinated by Native American history. His essay titled “Finding” – about his father’s obsessive collecting of Indian artifacts – is one of my favorites from The Geography of the Imagination. Apparently this sort of amateur archaeology is still popular in the South. John Jeremiah Sullivan’s “Unnamed Caves” (from Pulphead) explores the illicit artifact trade in Appalachia, a thematic homage to his hero Davenport, I’m sure. Though born in the South myself, I’ve lived most my life on the west coast where, for some reason, it never occurred to me that I might find any arrowheads lying around. It was more popular among the suburban cul-de-sac kids I knew to compare notes and see who had a higher fraction of Indian blood in his family. Through my wife, my children have managed to accumulate more of it than I was ever able to justify for myself. When the teacher placed before us a painted globe and said that our world was like that, that upon such a thing our forefathers had roamed and hunted for untold ages, as it whirled and danced around the sun in space – I felt that my foothold was deserting me. All my savage training and philosophy were in the air, if these things were true. Such a thing, he says. Eastman wants to belong to both cultures at once. Among the elements that make his books so intriguing is how well or how poorly he succeeds one moment to the next. In the final chapter of Before Philosophy, Frankfort identifies two historic exits from the “I-Thou” perspective: the monotheistic Jewish exit, where deity is conceived as starkly transcendent and the material world is God’s handiwork but never God’s self; and the Greek exit, where the personification of phenomena breaks down among the pre-Socratics and a proto-scientific perspective becomes possible for the first time. In the mingling of these two, Frankfort says, you have the germinal confluence of western culture’s past 2,500 years. Of course, it’s not really that simple. I wonder sometimes if Christian sacramentalism, for example, marks a counter-current. By insisting on God’s at least potential immanence in material objects (the Eucharist especially, but not merely) it does something, perhaps, to repopulate the non-human world. It never delivers one back to the full enchantments of pantheism, I suppose, but it may feed the same appetite by offering something approaching panentheism. I spent the spring break of my junior year of college working at an elementary school on a Cree reservation in central Alberta. Though most of the white farmers in the surrounding country were Protestants, most of the Cree themselves seemed to be Roman Catholics. They were therefore sacramentalists. The difference made an impression on me at the time, but I couldn’t plumb the wherefore of it. It’s interesting to note that while Charles Eastman converted to a non-sacramentalist Protestantism which he never seems to have felt really comfortable with, Black Elk converted to Catholicism and spent the last decades of his life as a pious and successful lay catechist. Certain whaling captains may be able to deduct expenses paid in 2011 for Native Alaskan subsistence bowhead whale hunting activities. We glimpse Ahab in the afterlife: an indigestible Jonah damned to inhabit an obscure deduction in the bowels of the Leviathanic federal tax code. 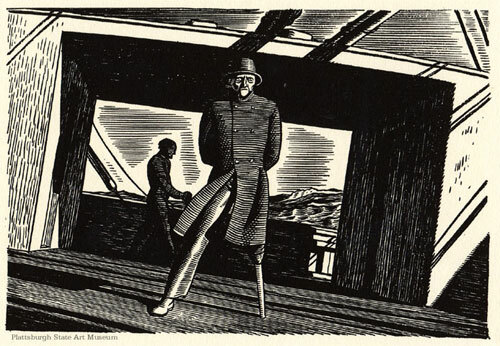 “The lightning flashes through my skull; mine eye-balls ache and ache; my whole beaten brain seems as beheaded, and rolling on some stunning ground.” Ahab, brother, I feel thee now! All the subtle demonisms of Form 1040 be cursed! Every spirit passing through the world fingers the tangible and mars the mutable, and finally comes to look and not to buy. I consider the room and wonder if this is how things end: the stack of books, the board games on the rug, the ukulele just there, the tea in my cup that will evaporate but leave a still detectable residue. So many of the objects we handle will outlast us. There’s always some unsuspected Vesuvius ready to end our fussing about. Is it strange to feel affection for the plants that will stretch themselves here and the creatures that will sniff and scratch long after the roof has collapsed and the soil and rain move in? Is it our own transience that makes us see things as transient? Immortal beings, with infinite perspective, may see only a single, immutable substance. If so, then pity the angels. We can know everything in nature except that which knows nature. To the extent that man is a piece of nature, he disappears. I can hold my breath for almost four minutes. I lie on my back, very still. I close my eyes and imagine that I am a piece of turf or rock blind to the sky above me. After sixty seconds my lungs begin to heave, but the heaving stops after another minute. The feeling of my body in space drains away. The sense of touch and weight recedes. Grass – Stone – Nothing in particular. Two minutes later there comes a ghost, an apparition that I rediscover as myself. Who marvels at a goiter in the Alps? People in the Alps used to be famous for goiters, the result of too little iodine in the soil. In his final essay Montaigne quotes Juvenal’s line – not because he suffered from goiter, but because he suffered from kidney stones. Montaigne meant that he wasn’t surprised at getting sick because that’s just what happens to our sort of creature. The Swiss started the fashion for iodized salt in 1922, but here in the U.S. things were still a little Alpish into the late ‘70s. As children we were always seeing old ladies with goiters at the local grocery store. 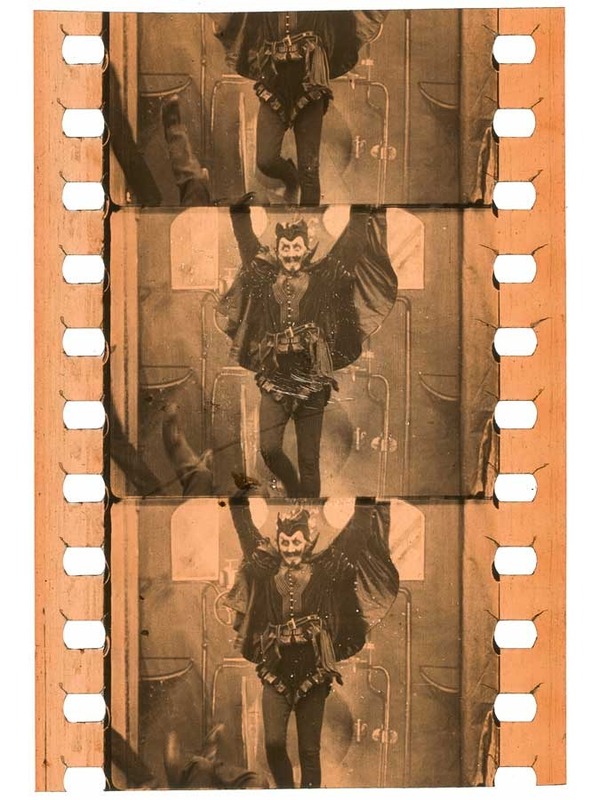 Nitrate film clipping from Charles Urban’s When the Devil Drives (1907).